Hardware is the new software and there is a race to the finish line. Unfortunately for Google and Microsoft not only has Apple long crossed the line but it has been running laps preparing for the real marathon. 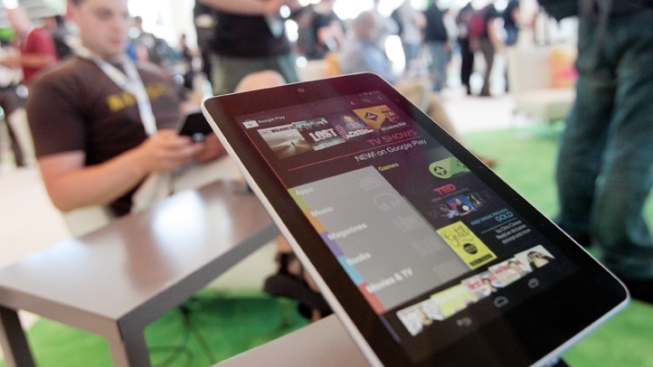 Wednesday at the I/O developers conference at Moscone Center, Google threw the new 7-inch Nexus 7 tablet in the race to dethrone Apple's Abebe Bikila, better known as the iPad. The Nexus 7 was developed with Taiwan-based manufacturer Asus and it comes complete with the new Android 4.1 operating system, or Jelly Bean, a Tegra 3 processor, a 1280 x 800 HD display, Wi-Fi, a front-facing camera, Bluetooth, a Near Field communication (NFC) chip and up to nine hours of video playback. Google's announcement comes just about a week after Microsoft introduced its own tablet computer where it controls both the operating system and the hardware, much like the Mountain View company. Also exactly like the standard set forth by Apple long ago. But Google also put the Nexus 7 in direct competition with the Android-running Amazon Kindle with an entry price point at $199. Neither Apple or Microsoft can compete with that. The tablet will be sold on Google's app store and it will come with a $25 credit to spend on Google Play, movies and magazines. The Nexus 7 will also come with a software feature built into Jelly Bean called Google Now, which will allow the tablet's software to study and learn the user's calendar, location and search history to remind them of potentially vital information. But Google may have stolen its own headlines when co-founder Sergey Brin announced that the company was now accepting pre orders for the Google Glass augmented reality glasses and that they will be priced at $1,500.